That is really beautiful. I love all of the embroidery. Gorgeous! I know how much you and Mr. Squash love birds -- I'm sure the girls love birds too, but for very different reasons. Kitten-hood last such a short time. Enjoy! They appear to have very fun personalities. 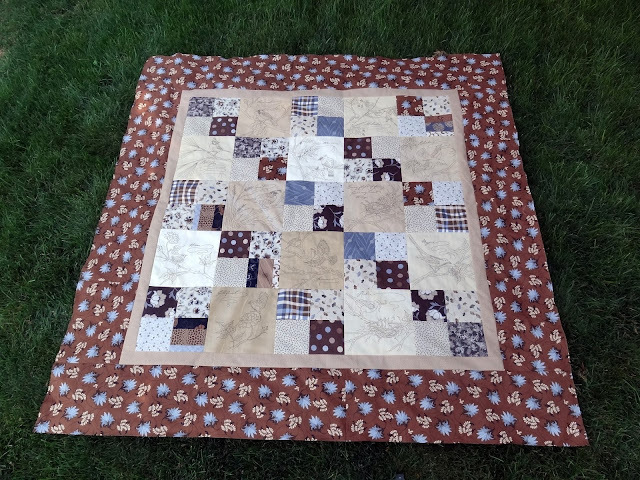 I have the same quilt top completed and am trying to decide how I want to quilt it. I used the French General fabrics including the linen bird print for backing. These blocks I embroidered during the last winter olympics. Now I need to pin it on the Gam and get it completed. What a nice treat for the kitty. oh my that Gracie May is a busy little bee. Sorry about the one project, cats just love all things quilting and can't stay away even if they know better I think. I've never had my cats go for the foam on my latte, that is way to cute!! I love the quilt you finished, wow, you did a lot of beautiful work on that one!! Hugs. Your embroidered blocks are wonderful! Yay for finishing a UFO! Cute kitties, I love that they like to share your latte foam! Oh Candace, I love the quilt. Your embroidery stitches are perfect and the birdies are so pretty! Sasha can't sneak a lick of foam, it will show on her face for sure. Oh the joys of kitties and their shenanigans. Can't wait to see your next finish. congrats on your finish! it is great. I have seen that same quilt done in reds which was pretty too. That is so cute about your kitty liking the foam on your coffee. Your quilts always amaze me...they're so lovely!! You're right. That wasn't really a UFO, just a WIP. Your embroidery is wonderful. Its a great quilt. What a great finish! I'm laughing at the antics of the kitties - oh my - they sure do keep us busy, don't they!? Beautiful finish, Candace! What a thoughtful gift from Mr. Squash! Your fabric prints compliment your stitcheries perfectly! Gracie and Sasha are too cute!! 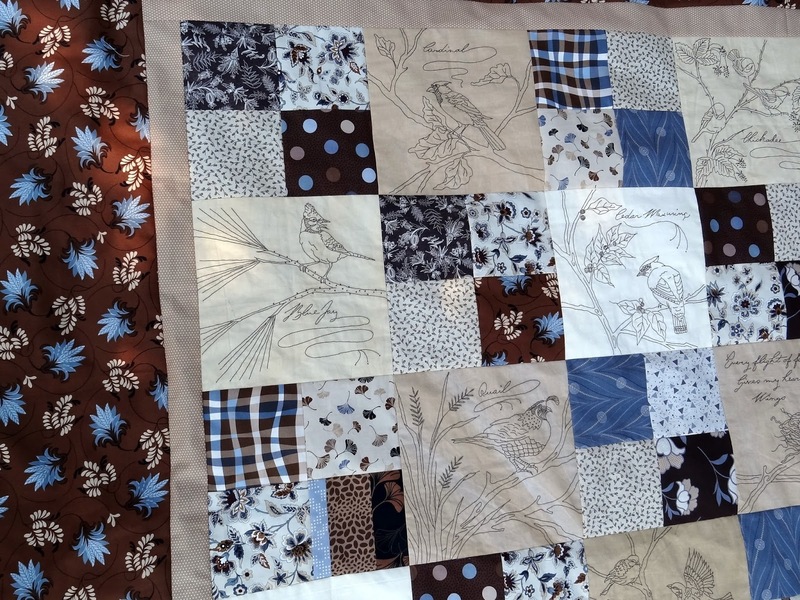 What a gorgeous quilt, Candace; I was going to say how much I love the bird print before I realized that was embroidered! One thing that made me realize I was becoming an adult was the ability to say no to a book that was not living up to my expectations. As a younger person, I felt a sense of failure in not finishing, but now I have come to find a little bit of triumph in being able to discern what I really enjoy! What a lovely finish. I am the same with mine but I still have 3 older UFOs to do. I promised myself I ought to do them for the Craft Olympics this year. Good luck finishing any other UFOs you have lurking.